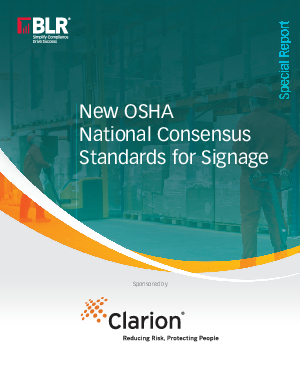 The Occupational Safety and Health Administration (OSHA) recently issued a new rule, effective September 2013, which updates OSHA’s 1971 workplace safety sign and tag formats with today’s best practice safety signage designs as defined by the latest American National Standards Institute (ANSI) Z535 standards. The OSHA signage change means that, over time, as employers adopt the newer ANSI Z535 best practice safety tag and sign formats, the United States will increasingly have a single, national uniform system of hazard recognition. Safety signs installed in facilities and public areas, temporary safety tags placed on equipment, and safety labels placed on products will all be designed using the same formatting principles. The outcome of such consistency is expected to be significantly more effective communication in the workplace. That, in turn, should help achieve the objective of fewer accidents and more lives saved from tragedy.